Voting begins Wednesday for the MTV Movie Awards, which air live on MTV June 6. Beware the power of an overwhelming That’s the first lesson of the 2010 MTV Movie Awards, because the votes are in and the Bradley Cooper-starring comedy leads the field with six nominations. Following close behind in that flick’s boozy wake are and each of which nabbed five nominations. “The Hangover” was tapped in categories including Best Movie, Best Comedic Performance (Cooper and Zach Galifianakis) and Best Villain (Ken Jeong). After “Twilight” led the 2009 awards with seven nominations, the vampire sequel’s 2010 nods include Best Movie, Best Female Performance (Kristen Stewart), and Best Male Performance (Robert Pattinson and Taylor Lautner). 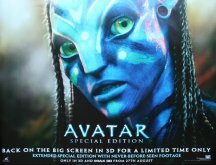 “Avatar” scored in such categories as Best Movie, Best Female Performance (Zoe Saldana) and Best Villain (Stephen Lang). Hosted by Aziz Ansari , the Movie Awards air live on Sunday, June 6, at 9 p.m. ET. Starting Wednesday, May 12, through Saturday, June 5, you’ll be able to head to MovieAwards.MTV.com to vote for a winner in every category. Voting for Best Movie, however, will stay open throughout the awards show on June 6 — meaning you’ll have a chance to affect the night’s biggest prize until the very last minute. Rounding out the Best Movie category are “Alice in Wonderland” and “Harry Potter and the Half-Blood Prince.” In addition to the “Hangover” and “New Moon” boys, the Best Male Performance category consists of Channing Tatum (“Dear John”), Daniel Radcliffe (“Half-Blood Prince”) and Zac Efron (“17 Again”). Joining Stewart and Saldana as Best Female Performance nominees are Amanda Seyfried (“Dear John”), Emma Watson (“Half-Blood Prince”) and Sandra Bullock (“The Blind Side”). MTV will also introduce three brand-new categories at this year’s show. Freaking over their nods for Best Scared-as-Sh– Performance will be Alison Lohman (“Drag Me to Hell”), Amanda Seyfried (“Jennifer’s Body”), Jesse Eisenberg (“Zombieland”), Katie Featherston (“Paranormal Activity”) and Sharlto Copley (“District 9”). The Biggest Badass Star category has laid the smackdown on Rain, Angelina Jolie, Channing Tatum, Sam Worthington and Chris Pine. And swooping in to compete for Global Superstar are Pattinson, Stewart, Lautner, Radcliffe and Johnny Depp. The Best Kiss category will feature a lip-smacking showdown of “Twilight” franchise stars: Stewart and Pattinson (“New Moon”), Stewart and Dakota Fanning (“The Runaways”), and Lautner and Taylor Swift (“Valentine’s Day”), as well as Bullock and Ryan Reynolds (“The Proposal”) and Saldana and Worthington (“Avatar”). Battling it out for Best Villain will be Jeong (“The Hangover”), Lang (“Avatar”), Christoph Waltz (“Inglourious Basterds”), Helena Bonham Carter (“Alice in Wonderland”) and Tom Felton (“Half-Blood Prince”). The Critics Choice Award for Best Cinematography is one of the awards given to people working in the motion picture industry by the Broadcast Film Critics Association. It was first given out in 2009.